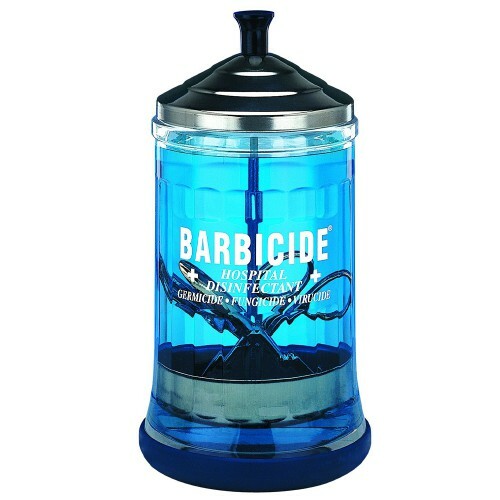 The Barbicide disinfection glass is used for the professional disinfection of scissors, combs and nail care instruments. The attractive glass with stainless steel insert is known around the globe. The transparent look and the characteristic blue colour can be seen in thousands of hairdressing salons, but also in nail studios, wellness centres and fitness studios. The glass is so large that you can completely immerse tools in the disinfectant solution. It has a non-slip stand and a stainless steel lid. The removable sieve allows the removal of the tools without skin contact with the solution.